Israel got a little help when it eliminated a delegation of Hezbollah terrorists on Monday, Hezbollah claims. Hezbollah's official media outlet has claimed that Saudi Arabia helped Israel to eliminate a delegation of Hezbollah terrorists and Iranian soldiers on the Syrian side of the Golan Heights Monday. The comments came during a report on the Al Manar TV channel about the Israel Air Force's elimination of Jihad Mughniyeh and Iranian field commander, General Mohammad Ali Allahdadi, earlier this week. Quoting Hezbollah sources, the report claimed that the Saudis had provided “direct information” to Israel about the movements of the two vehicles Mughniyeh, Allahdadi, and other Hezbollah terrorists were traveling in. According to Hezbollah, Saudi Arabia and other Sunni Gulf states are sending “regular and constant reports” to Israel about the movements of Hezbollah, Iran, and pro-regime Shia militias in Syria, as part of their campaign to keep Iran and its “allies” in check, the report said. Israel has been using this information to support groups fighting against the Shia militias. Iran's Shia Islamist and Sunni Saudi Arabia are arch-foes, with both supporting opposite sides of the Syrian civil war in just one of several fronts in what is essentially a mini-Cold War between the two. Israel and Saudi Arabia - traditionally enemies themselves but both equally concerned about Iran's nuclear program - have reportedly forged close (though covert) ties in recent year to combat Tehran's regional ambitions in response to the softening of western states' stances towards Iran. Meanwhile, northern Israel is on full alert in anticipation of a possible - or even likely - terror attack by Hezbollah, after IDF forces eliminated the terror squad on the Golan Heights Monday. Roads in the area of the Israel-Lebanon border have been closed, and on Tuesday tanks and armored personnel carriers were deployed along the northern border. 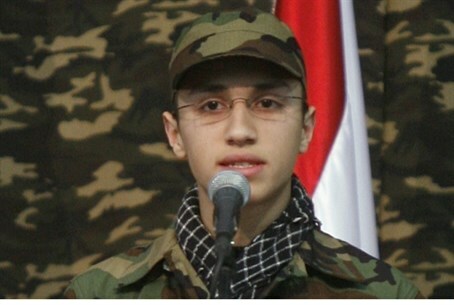 Earlier, reports emerged that Jihad Mughniyeh, who is the son of arch-terrorist Imad Mughniyeh, was one of the personal bodyguards of Hezbollah leader Hassan Nasrallah. In addition, the sources said that the vehicle that Mughniyeh and his fellow Hezbollah terrorists were riding in had “definitely” entered the Syrian side of the Golan from Lebanon. Israeli sources said that Mughniyeh had been seen in a video taken on December 6, 2011, when Nasrallah emerged from his underground secret bunker for a rare public appearance. Nasrallah has been “off the radar” for years, fearing that the IDF would target him for elimination. During a speech Nasrallah made, Mughniyeh appeared on stage with the Hezbollah terror chief, positioning himself to the rear of Nasrallah – in essence “watching his back” as one of the security staff. Meanwhile, Lebanese sources said Tuesday that the two vehicles targeted by the IAF in the attack – one of which carried Allahdadi – had left Lebanon hours before they arrived in Quneitra on the Syrian Golan. The purpose of the tour, the sources said, was to allow Allahdadi to review the situation on the border with the purpose of developing new attacks on Israel.